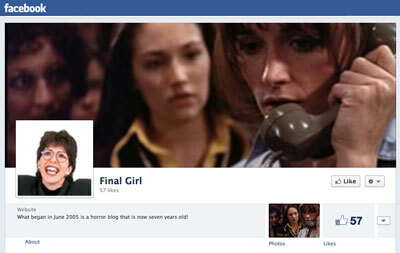 I made a Final Girl page over at Facebook. Isn't that just the most? It is and you know it. So if you're on FB, head over for some jibber jabber and whatnot. If you're not on FB, don't worry, all posts will still be here. Over there is like the donuts after church or something. Don't people eat donuts after church? I don't know, I don't go to church. But if they're NOT eating donuts afterwards they should really reconsider.